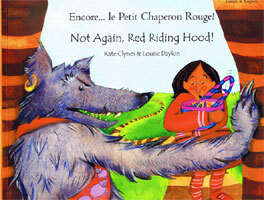 Colourful, lively illustrations accompany this dual-language story, a delightful sequel to the popular story of Little Red Riding Hood. Red Riding Hood enters the woods again to deliver cookies to her dad. On the way she meets some very hungry characters from well-loved stories and yes, once more, is in danger. Will dad get his cookies or will the wolf get to her first? With the full text in both English and French, the familiar story will inspire both early readers and older learners who enjoy reading French and English in parallel. This book is a high-quality dual-language picture book, suitable both for children who are learning and reading French and English in parallel and those being introduced to French as a second language. The French in this text is not simplified in any way so would be best suited to parents and/or children who already have a reasonable grasp of the French language. Thank you for this book. My granddaughter and I can read it together in English and her French grandmother can read it in French. We all enjoy it and it helps her to maintain her accents and language skills in both languages.